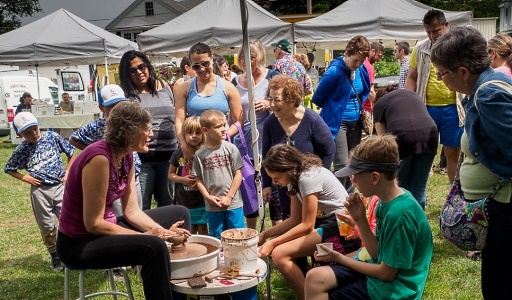 In addition to the stores listed below, you can call and make an appointment to view my art and pottery in my studio in Ashland: 508-686-6046. 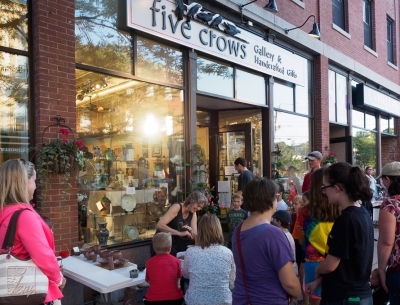 Five Crows is an arts and crafts store selling many pieces of my functional pottery, Reminder Stones, Rear View Mirror Charms, and "Breath" prints. Even if you aren't shopping for my art, it is a great store. Worth checking out! My work has been there since 2009. Current display here. 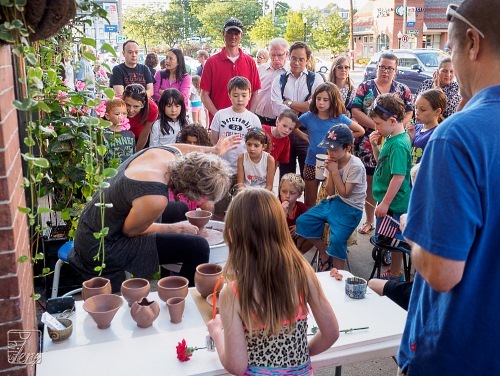 The image is from when I demonstrated outside the store during the Art Walk, July 2015. More images here. 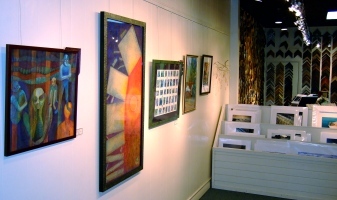 A local artist store in the Mall on the 2nd floor of the newest wing where the birch trees are. 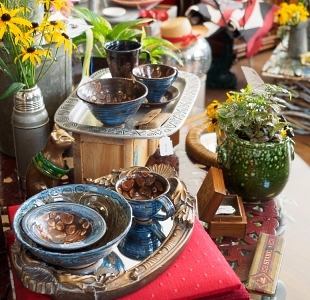 You will find there my functional dinnerware, Reminder Stones, Rear View Mirror Charms (or hang anywhere), and more. This store is owned by a friendly and talented artist: Eugin Kim Neilan. Also local, she makes and sells awesome T-shirts with encouraging words and images such as some of my favorites: Create More, Dare More, Breathe More. 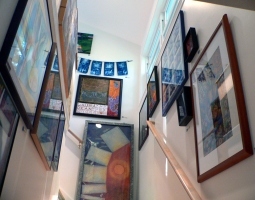 Other local artists are also promoted here so it is a wonderful store to check out anytime! My work has been there since Jan. 2014. Current display here. The image is from when I demonstrated outside the store during the holidays, Dec. 2014. 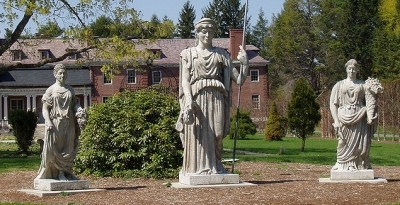 Elm Bank is a pleasant place to walk, see gardens, and have events. 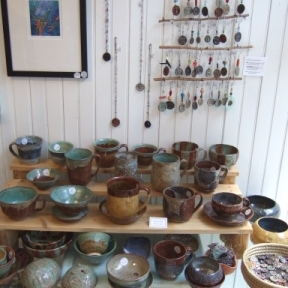 I was contacted in 2018 to show my pottery in the gift shop there. They wanted to have items for sale there through October and for weekend holiday sales. 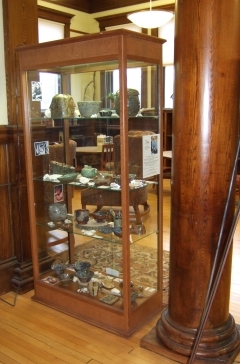 What they have of mine includes beaded and corded necklaces, bowls, and reminder stones. My work has been there since Aug. 2018. Current display here. 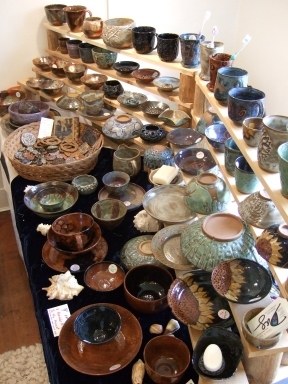 A small bright gift shop offering “jewelry, art and whimsy” and my pottery! Owner Lori Burton is so friendly. 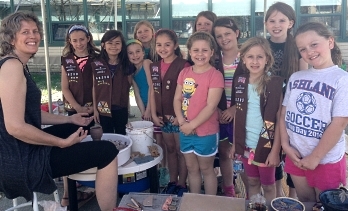 Her goal for her store is to offer a little bit of something for everyone. She wants people to walk into her store and find the perfect gift — that one thing they didn’t even look for. 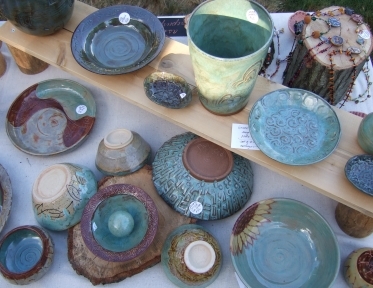 Saturday 2/7/15, 1-4 pm, I did a wheel throwing demo and "trunk sale"
I sold my pottery, photographic notecards, and Phil's photographic notecards along side other artisans. 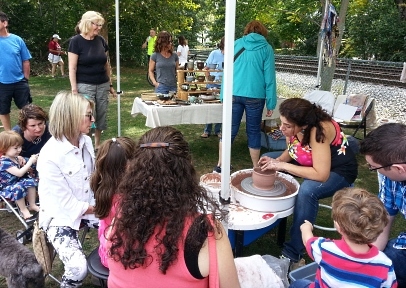 Pottery students showed you their skills with throwing pottery on a wheel. 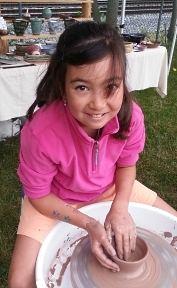 I am proud of their abilities and they were excited to share their passion for pottery with you. (picture is of four of their pieces: top row is Tonya's, bottom row is Olga's). 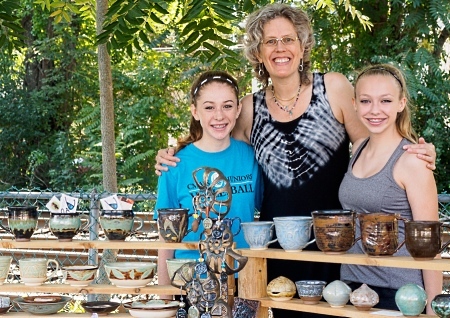 Tonya and Olga are moms and full-time engineers who find pottery to be a creative outlet that rounds out their lives. 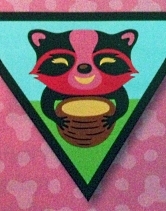 Tonya likes to put hours of time into doing unique carvings to decorate her pottery. 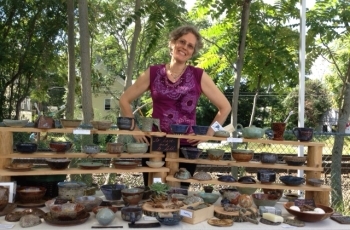 Olga often integrates creative hand building with her wheel work, and discovers new effects using hand-painted layered glazes. 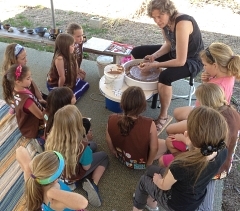 The motivational (mudivational) give-and-take of ideas, techniques, and encouragement happens every class, making all participants productive. 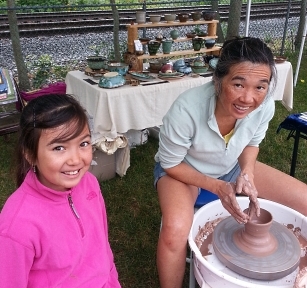 Other students have joined Debra in her pottery studio too. Come and see what they can do after a few lessons! past tense example: My students mudivated me too! 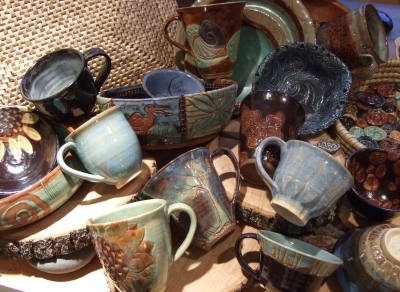 as can pottery shows at places like the Fuller Craft Museum and here! Click on the link above to see more pictures and blog about 6/27/15. 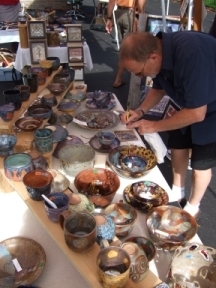 Here is a link to some pictures from AFM 7/18...and ArtWalk 7/16. Tonya from 6/27, helped 8/29 too! 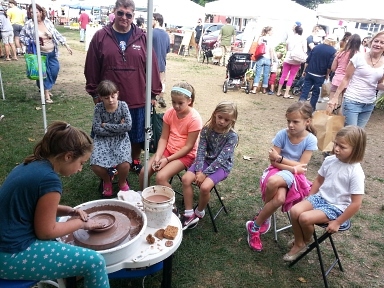 Photo shows Debra's 14 year old students, Shannon and Abbie, who came to do work on the wheel, showing skills they learned in their first 3 classes. 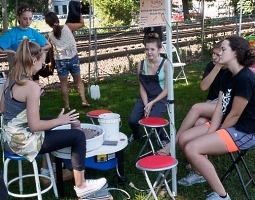 Here is a link to some pictures from ArtWalk and Ashland Farmers Market 7/18. 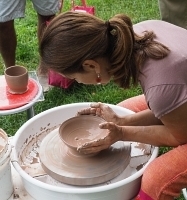 wheel throwing (pottery demo) at uni-T, my pottery 20% off! 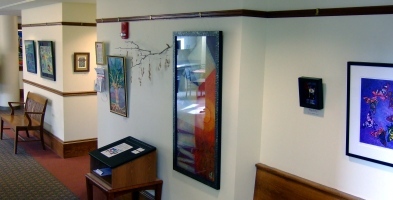 A local artist store in the Natick Mall: 2nd floor of the new wing. 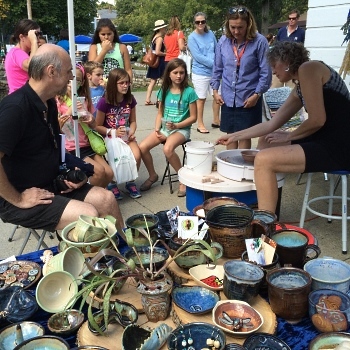 Pottery sale in Dorchester! 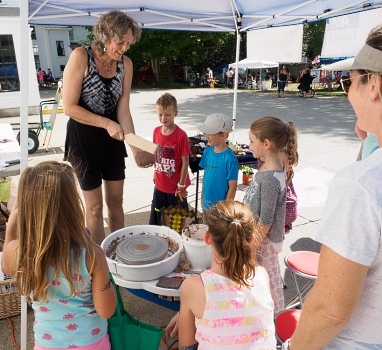 CropCircle Kitchen, is a culinary incubator and shared kitchen in Jamaica Plain and Dorchester. I met lots of new people. Nice to get more positive feedback too. 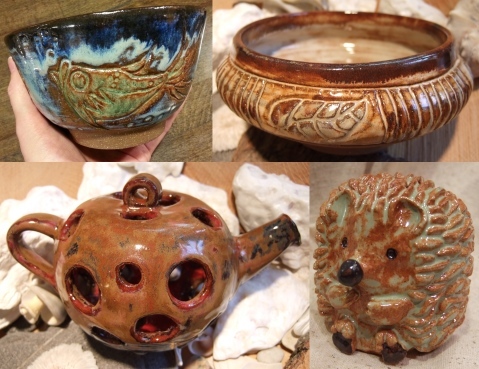 I did a clearance sale of a lot of my pottery and had some higher priced items there as well... along with photographic notecards, Reminder Stones, and necklaces for sale too. 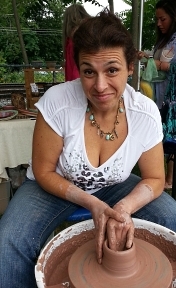 My adult student, Tonya, did helpful wheel throwing demos. Children (and adults) stayed for a long time to watch and ask questions. Their wonderful questions showed their thoughtfulness and intellect. I did a demostrations of wheel throwing until the power supply I had ran out. Then I showed carving and shellac resist techniques. The amount of onlookers and interest was so exciting. 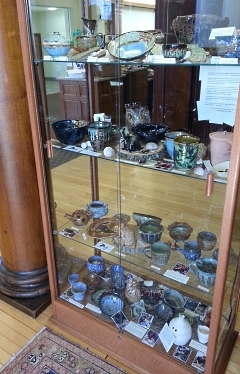 My pottery display in the glass case on the first floor showed a variety of things that I make: small items that you carry in your pocket, necklaces, glaze test pots, functional dinnerware, sculptures, and more. It includes labels to explain some of my techniques and inspiration. 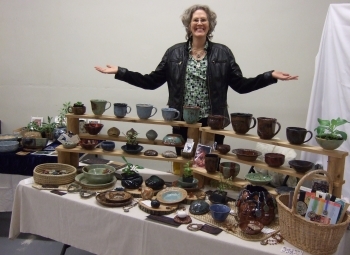 I showed my comfort pottery but also beaded jewelry, photographic note cards and small framed mixed-media art! 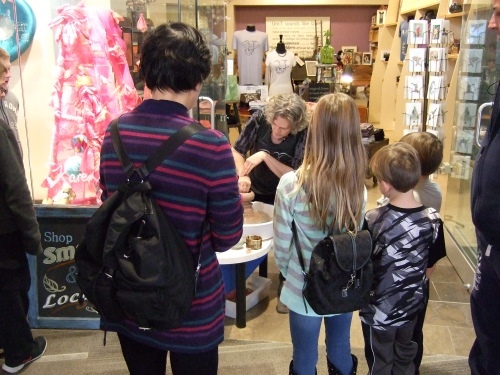 I did demos and discussed my private art lessons. Phil and I made a new wooden shelf for my display; this is the first time I used it and it worked great! I designed it myself. I did a clearance sale of a lot of my pottery...$15 for each! 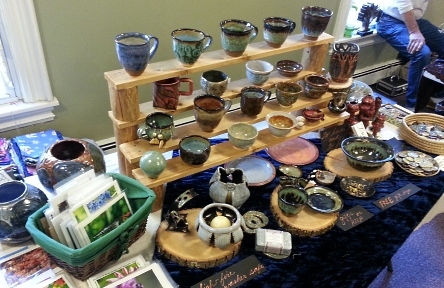 I had photographic notecards, soap dish rests, and reminder stones for sale too. Newer and bigger work was not sold here . I did demos all day. 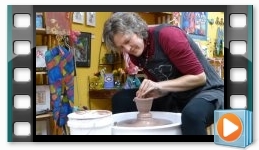 I showed some of my special surface decoration techniques on pots that I threw on my wheel in my studio (sponging off clay that has a resist painted on it, carving, and more!). 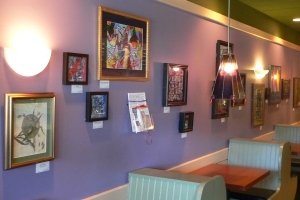 Featured Artist: July 19-August 10, 2013! 2 week show...70 pieces of pottery...two times demonstrating surface techniques with collaborative bowl option. 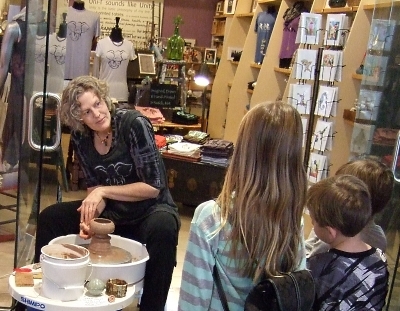 This time of demonstrating and discussing pottery was a wonderful experience. I was at Pondside Dental Assos. (793 Centre St. JP) showing mostly my pottery but also beaded jewelry, photographic note cards, framed mixed-media art, and wearable art! In 2012, I did demos each day. 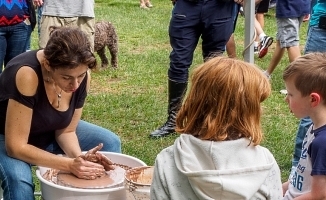 I showed some of my special surface decoration techniques (sponging off clay that has a resist painted on it, carving, and more!). 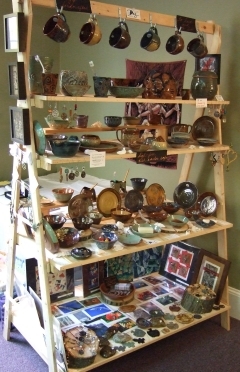 Many visitors to my display tables in 2011 voted in De Pot Ballot sharing what were their favorites pieces of pottery or art. This was very helpful for my confidence and the votes might affect what I make in the future. 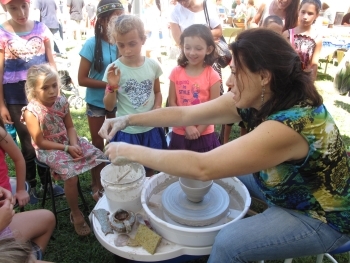 The Pottery Lottery (held in 2010) was a big hit. Almost 200 people participated. There was an excited crowd near my table during the drawing time: 4 pm Sunday. A youngster volunteer randomly picked the winner: Isaiah, a 4 year old boy. Isaiah choose a nice big bowl he can grow into. He returned with his mom in 2011. 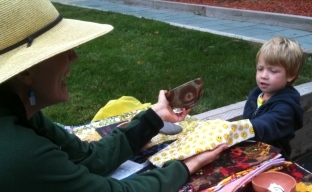 She shared how much he uses it, loves it, and how it is holding up even with regular use by a young child. Yay! 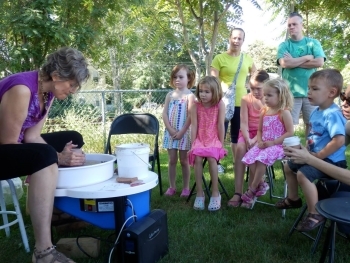 I was invited to be on the Ashland Garden Tour again. 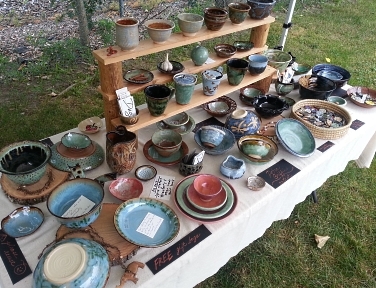 I showed my garden and sold my artwork (pottery, jewelry, notecards, and framed art)! It was great to see some of you here! 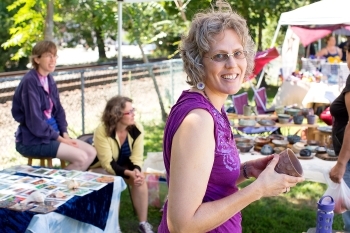 Besides my work (pottery, jewelry, and notecards), there was over 60 art vendors, music and theater performances. 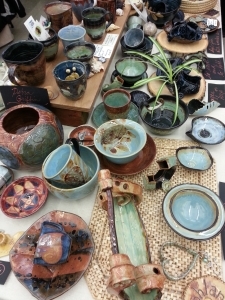 I mostly showed my comfort pottery but also beaded jewelry, photographic note cards and small framed mixed-media art! 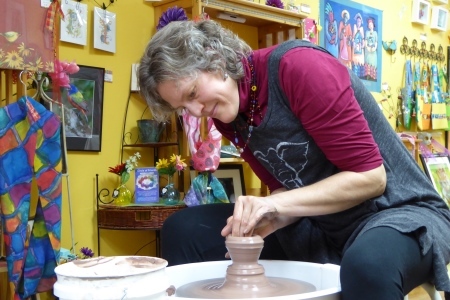 I was honored to be asked by the store owner, Ivy, to have my pottery at this store which focused on local crafts for two years before closing in Aug. 2016. My work was there from Feb. to the end of Aug. 2016. To the right is a picture of work brought to the store summer 2016. I have been getting my curly hair cut expertly by Jeannine using dry Deva Cut techniques for years. I found her when she worked at a salon in Ashland. Then she opened her own salon in Lincoln. 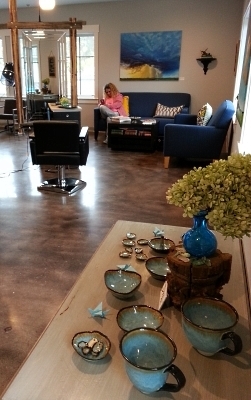 During a hair cut, we discussed a line of pottery for her salon. 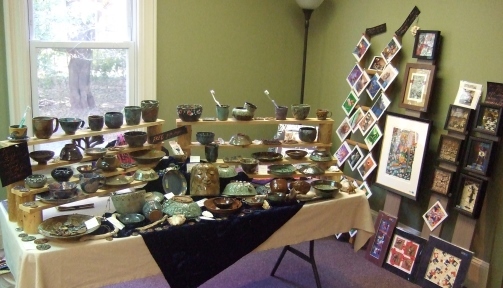 I made the salon many pieces (mugs, handbuilt bowls, pendants for necklaces and earrings). "Sky" is written on the back or side of most pieces. The opal color matches the beautiful sky paintings that decorate walls; the talented artist is Jeannine's husband. 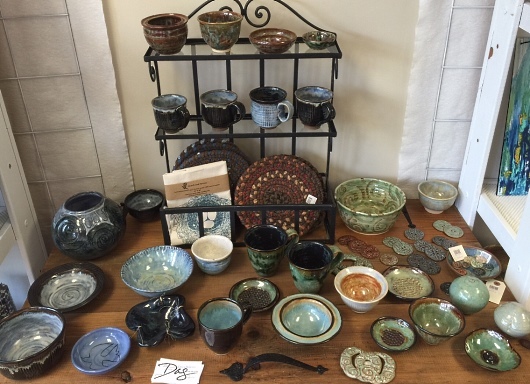 My pottery was there in Oct. 2015 but most pieces have sold as of July 2016. My work had been here in my own town since Nov. 2013. To the left was my display in July 2015.